Your big day is looming near, and like most brides you’re probably already spinning numerous logistical plates on top of your full time job and the minutiae of day to day life. The planning of your wedding is a wonderful and magical time filled with excitement and joy… But it can also be incredibly stressful. Between the expense, the enormous effort that goes into planning and organizing a wedding in the 21st century and the sheer number of moving parts that go into a modern wedding, it’s probably all you can do not to transform into some sort of monstrous bridezilla who rules the wedding planning with an iron fist and an incredibly short temper. 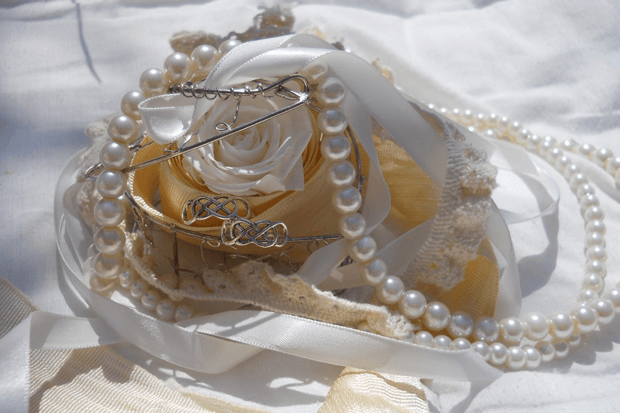 In an effort to take a little of the stress out of your wedding planning, I’ve compiled this helpful compendium of easy to remember advice for choosing the perfect wedding jewelry to match your gown. Your wedding dress is obviously the focal point of your look on your big day, and it’s important that your jewelry matches the colour scheme. This means that if your dress is white, complement it with silver, white gold or platinum to really add a sense of brilliance and sparkle. Diamonds, cubic zirconia and Swarovski crystals are also great ways to set your look off even if you have a limited budget. If your dress is a creamier champagne or ivory colour, yellow or rose golds will really accentuate the warmth of the fabric. If your tastes veer towards the classic you can add an antique effect by using burnished silver inlaid with rhinestones. The neckline plays a huge part in determining the overall effect of your dress. For sweetheart or strapless dresses consider using a choker or short chain to add a sense of height. For v necks, a diamond pendant is the perfect choice to top off your look. For halter necks, your best bet is to accessorize your hair. Adding jewel encrusted pins, and combs or an embellished veil will add a real sense of classical opulence. Your wedding should be a lavish and celebratory occasion but you should still feel like you can make it your own. While you’ll look breathtakingly beautiful whatever, it’s important that you feel beautiful and comfortable. It’s your big day after all! If you have a buoyant and effervescent personality don’t be afraid to add some embellishments that reflect your personal style.